Three generations of men are lost in the ‘jungle’ of Bagnoli, a world-weary and degraded working class neighbourhood of Naples. Giggino is a 50-something poet at a restaurant and a petty thief on the streets. His octogenarian father, Antonio, was once employed by a large Naples steel mill but now lives a life of nostalgia telling stories about local mafia and Maradona’s football feats. Marco, at age 18, is a street-savvy deli delivery boy who struggles with concepts of his future and the road to get him there. The travails of these three very human characters get told across separate chapters, captured by a fly-on-the-wall handheld camera that smudges the line between documentary and fiction. Raw and gritty, Napoli Jungle doesn’t hold back in its depiction of a community aimless and defeated – the abandoned factory of Antonio’s past looming over the film as a silent witness to failure. Reflections, poetic license, cruelty, racism, misadventures, the mafia, customs. A vital and interesting fresco with great actors. 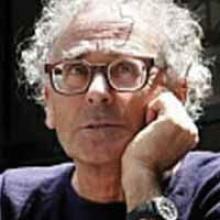 Born in 1940 in Naples, Antonio Capuano is a writer-director known for the films Pianese Nunzio, Fourteen in May (1996), Red Moon (2001) and Mario’s War (2005).